Stop Hunger Now launched a worldwide campaign in Genoa, Italy this week in recognition of Mandela Day on Monday, July 18. Enrico De Barbieri, Honorary Consul of the Republic of South Africa in Genoa, with Stop Hunger Now Chief Marketing Officer Tom Barbitta. Stop Hunger Now, an international nonprofit based in Raleigh, NC, kicked off a worldwide campaign in Genoa, Italy this week in recognition of Mandela Day on Monday, July 18. A special gala event was held in Genoa, hosted by Mr. Enrico De Barbieri, Honorary Consul of the Republic of South Africa in Genoa. The Honorary Ambassador De Barbieri was recently named Global Food Security Ambassador for Stop Hunger Now, and will represent the nonprofit to raise awareness of global hunger. 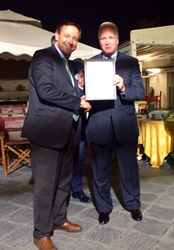 At the event, hosted by Stop Hunger Now Italia and attended by local Italian dignitaries, Stop Hunger Now Chief Marketing Officer Tom Barbitta was presented with a letter from the Italian Royal Family, the House of Savoy. The event in Genoa launched Stop Hunger Now’s campaign to package 10 million meals in recognition of Mandela Day. Mandela Day, celebrated each year on July 18 to commemorate the late Nelson Mandela’s legacy, is an opportunity to inspire individuals to build a global movement for good. In 2009, the United Nations General Assembly designated "Nelson Mandela International Day" in honor of the former South African President to recognize his contribution to the culture of peace and freedom. Teams of Stop Hunger Now volunteers will package meals in Malaysia, India, South Africa, Italy and the United States.